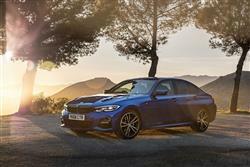 The BMW 3 Series gets wide-ranging improvements in seventh generation form. Jonathan Crouch takes a look. The BMW 3 Series has ruled the compact part of the mid-sized executive segment for more than forty years and the company's hopes are high for this seventh generation version. It's smarter, slightly larger, more efficient and considerably high-tech. All the things you'd expect really. Something else you'd expect from this model is rear wheel drive handling purity. It doesn't disappoint in that regard either. The BMW 3 Series Saloon has had an unparalleled reputation both for its quality, and supreme handling in the premium midsize segment for more than 40 years and this, the seventh generation, raises the bar even higher. When the first BMW 3 Series was launched in 1975, it revolutionised the segment and became the Munich maker's most successful car. Since then, over 15 million 3 Series models have been sold globally and this contender is regarded as the heartbeat of the brand. With revised styling, improved driving dynamics, better efficiency and innovative features, this seventh generation model aims to continue that success story. A stiffer more sophisticated platform with revised suspension, plus stronger safety standards, a more up-market cabin and wider-reaching media connectivity will all help in that regard. It's still rear wheel drive of course - though xDrive 4WD is, as before, as option. Upgraded four-cylinder engines from BMW's Efficient Dynamics family are used in the 320d diesel (190hp) and 330i petrol (258hp) models that kick off sales of this seventh generation design in the UK. You can also ask about a six cylinder 330d diesel variant and a 330e iPerformance petrol/electric Plug-in hybrid. A new- generation six-speed manual gearbox is standard across the range, or there's the option of eight-speed Steptronic auto transmission. Systematic upgrades have been made to the TwinPower Turbo technology used in the 2.0-litre four-cylinder diesel engine featuring in the 320d which puts out 190hp and generates 400Nm of torque. This enables a 0-62mph sprint time of 7.1s (or just 6.8s for the auto). You can shave a couple of tenths off those figure with the xDrive system. The handling promises to be even sharper thanks to a wider track, and a chassis that's up to 50% stiffer in some areas and which features special lift-related dampers. A 55kg weight reduction this time round also helps. Adaptive M suspension can be specified on 'M Sport' models. And 330i and 330d buyers will be offered an M Sport differential for the rear axle which helps to enhance traction, agility and cornering. This seventh generation 3 Series model has had its proportions radically revised. The MK7 design is 85mm longer than its predecessor and 16mm wider, but just 1mm taller. Added to that, its wheelbase has been extended by 41mm and its track widths are wider too. As usual, there'll be saloon and Touring estate body styles. At the front, the large BMW kidney grille elements are framed by a single surround and split up by wide bars and link to the headlight units. The Munich brand's customary twin headlights feature the familiar two-way split that is further emphasised by an eye-catching notch in the front apron that rises into the headlight contour. The bonnet has four contour lines leading to the BMW kidney grille. A pair of character lines rise to the rear of the car at door-handle level and a contour line near the side skirts guides the eye to the sculpted rear wheel arches. There's the usual 'Hofmeister kink' near the rear C- pillar. And at the rear, slim, darkened light units house L-shaped taillights. Inside, the instrument panel has a modern, light look with horizontal lines, high quality electroplated trim strips and contours that extend into the doors. The newly-designed instrument cluster and Control Display form a large surfaced screen grouping, while the controls not included in these units are arranged into clearly structured function panels. Your dealer will also be keen to tell you about this MK7 model's clever 'Intelligent Personal Assistant', a voice-activated infotainment system that responds to the prompt "Hey BMW". When you pause to consider that one product line - the 3 Series saloon - accounts for fully a quarter of BMW's global sales, you begin to appreciate quite how much there is riding on this car. 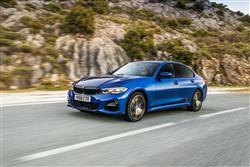 Pricing starts at around £34,000 for the 320d diesel - with a premium of around £2,800 more for the xDrive system. You'll need a budget of around £38,000 for the 330i petrol model. For that though, you now get quite a lot, with even base 'SE' trim now featuring kit like Extended LED headlights, 17-inch alloy wheels, LED front fog lights, interior Ambient Lighting with up to 11 colour settings, a reversing camera, three-zone air conditioning and enhanced acoustic glazing. 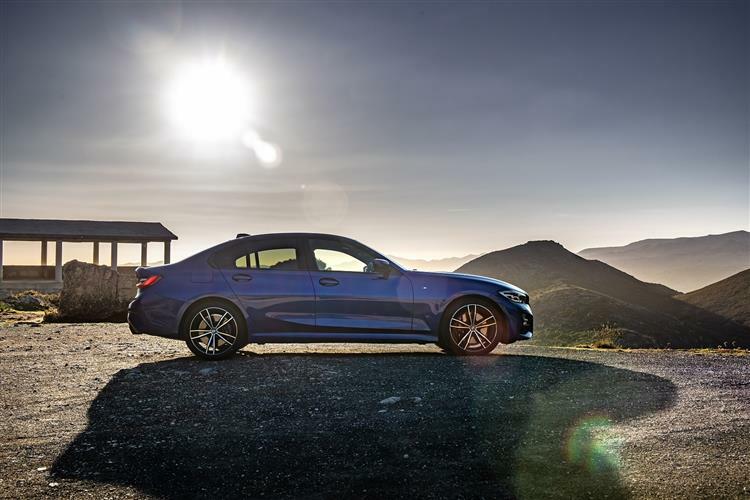 All 3 Series models benefit from 40:20:40 split folding rear seats and folding rear headrests as standard. The entry model features a leather Sport steering wheel and BMW Live Cockpit plus, with its 8.8-inch central instrument cluster. There's a slightly more dynamic-looking mid-range 'Sport' model but if budget permits, you'll probably want to stretch up to top 'M Sport' trim. This gives you a body kit, sports seats, an M leather steering wheel and the new 'BMW Live Cockpit Professional' dash package, which gives you a 12.3-inch digital instrument cluster, a 10.3-inch central instrument cluster and BMWs brand new ID7 operating system. 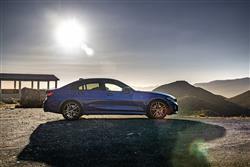 BMW has concentrated on improving the efficiency of the 3 Series and there are benefits right across the board. The 320d variant's improved 2.0-litre powerplant now includes multi-stage turbocharging, which brings increased efficiency across all engine speeds. 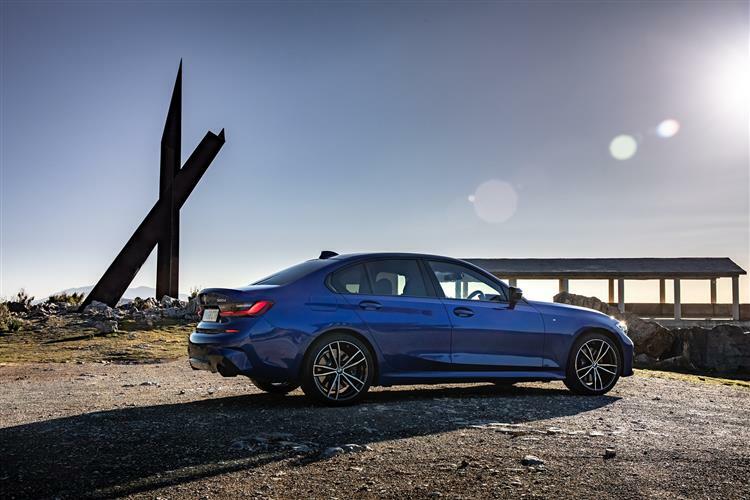 Average fuel consumption is rated at 64.2mpg for the 2WD 320d (the automatic version registers 67.3mpg) - or 62.8mpg for the 320d xDrive. 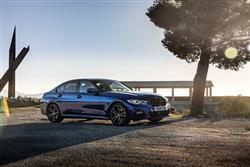 The 320d's CO2 emissions are 115g/km (or 110g/km for the automatic), while the 320d xDrive's CO2 emissions are 118g/km. For the auto-only 330i petrol model, the combined cycle figure is 48.7mpg and the CO2 reading is 132g/km. If you want to do better, you can ask about the 330e iPerformance petrol/electric Plug-in hybrid. The Steptronic automatic transmission option features a coasting mode so that when the driver lifts off the throttle at higher speeds, for example on a gentle downhill grade on the motorway, the engine is automatically decoupled from the powertrain. It then simply ticks over in neutral, which saves fuel and ensures there is no unwanted engine braking at high speed. An additional fuel-saving feature, which also improves driving comfort, is the Proactive Driving Assistant, which uses information from the navigation system to "anticipate" upcoming roundabouts, corners and junctions and select exactly the right time to change gear. 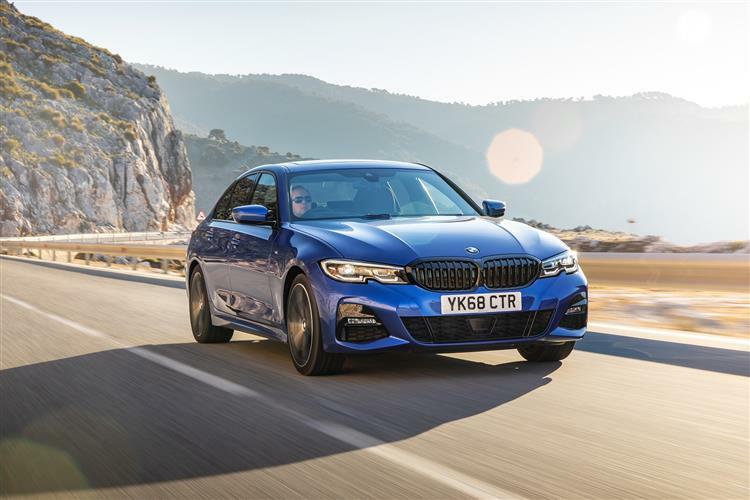 'More where you need more and less where you want less - otherwise leave well alone' seems to be the mantra of this seventh generation BMW 3 Series. If BMW wanted to build a model that would convert those who didn't previously fancy a 3 Series, then this MK7 design probably isn't that car. Its appeal is largely the same. If, on the other hand, you're crunching hard numbers, then it's hard to see this Munich maker's much improved mid-sized executive model coming off second best to anything in its division. The class-leading rear-wheel drive driving dynamics are merely the icing on the cake. Beneath the styling changes and interior upgrades are some serious engineering updates. A new family of petrol engines and big changes to the diesel powerplants come winging in, delivering unprecedented performance/economy combinations. The 3 Series has changed a lot about the way we buy cars in this class, continually forcing its rivals to play catch up. This one's no different. As you were, people.